If you are starting a personal site or a small business, Voxility is definitely not for you. It’s a solution for large-scale enterprises that are looking for unique internet tools and solutions for their business. Voxility’s services are over the top and indefinitely reliable. It is a company worth recommending and a deal worth making. The Internet is a wild place. While it’s a haven for some, it’s a straight nightmare for others. However, it all depends on how one chooses to optimize it. If you aren’t going to abuse it, the Internet is literally a spectacle for this world. From banking to shopping, everything is carried out online nowadays. As a consequence, businesses of all sizes are being operated through the internet. 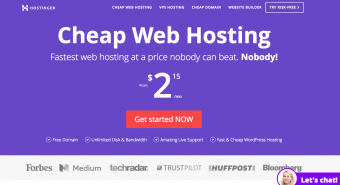 But let me state out one tiny dilemma, resources for small companies could be found in minutes over the internet, though if you are running a large organization, you gotta dig in deep to find ultimate hosting services and solutions for your company. In this article, I’ll be reviewing Voxility, a core solution handy for all big corporations. Voxility is an Infrastructure-as-a-Service who excels in determining exactly the type of services their client needs. It’s a company which deals in premium Data Center services such as Dedicated Server hosting, world-class Colocation services, DDoS protection solutions, IP transit and custom built infrastructure hosting for large organizations all over the globe. Their proficient team of +40 members has worked together for years to build a trademark of superiority and respect among their clients. They’ve successfully served for quite a few of the greatest brands in the market like Equinix, Telehouse North, Coresite, Interxion, etc. Distributed denial-of-service (DDoS) attacks are a growing-threat to businesses worldwide. Designed specifically to detect and stop DDoS attacks, Voxility DDoS Protection Solution help business operations running smoothly. Massive DDoS attacks can cause inoperability of the entire infrastructure and a service outage. Frequency, size and sophistication of the attacks are constantly evolving, DDoS attackers shifting their focus from the network and transport layers to the application layer. Many companies adopt a multi-layered defense strategy in which different security offerings complement each other. Voxility helps ISPs, cloud & hosting providers, streaming & gaming companies and large enterprises stop DDoS attacks like SYN floods, UDP floods, DNS amplification, volumetric attacks and many other types. Their cloud-based solution is entirely designed and developed in-house which means is highly customizable to client’s needs. Voxility is not similar to other web hosting providers. All of their dedicated servers are HPE, which I think is a very smart choice. They offer full API control and there is absolutely no fuss about going through the setup. You are guaranteed with 10-40 Gbps of Internet Access, and on top of that, you can opt to be charged by the hour. Voxility is providing world-class Colocation services in reasonable price range. You could boost your business by placing your equipment in exactly the location where you are sure the top most networks are located. It allows you to connect to other ISPs in the same datacenters as most of Internet’s leading players are situated. You could simply set up Colocation for 10U, half cabinet, full cabinets or more according to your requirements and connect with hundreds of Internet Service Providers and cloud providers. Voxility has its own wide range of data-centers scattered all across the world. All of these 17 data-centers are fully managed and act as the source of supplying services to their clients. Voxility installs servers and networking equipment in each location, offering premium datacenter services, 24/7 support, top notch anti-DDoS and large bandwidth availability. One of the best features granted by Voxility is definitely their ability to let clients either buy or rent the services. This is a beneficial trait, for both the customers and Voxility. However, it’s a great way to build a foundation by renting their solutions for however long it’s required. Contract terms start with 1 month and go up to 3 years. After all, there are several occasions where you might be in need of a project where short-termed hosting is preferred. If long-termed, you can just simply proceed to purchase it. Voxility offers a wide range of Network services with good ping latency globally which makes them the right choice for large enterprises that have advanced Internet speed necessities for their online presence and day-to-day operations. The customer support is also excellent. Usually, their staff responds within minutes and once they are acquainted with your query, they proceed to sort the problem out almost immediately. Another added bonus is that they are friendly, and at the same time uniquely professional. 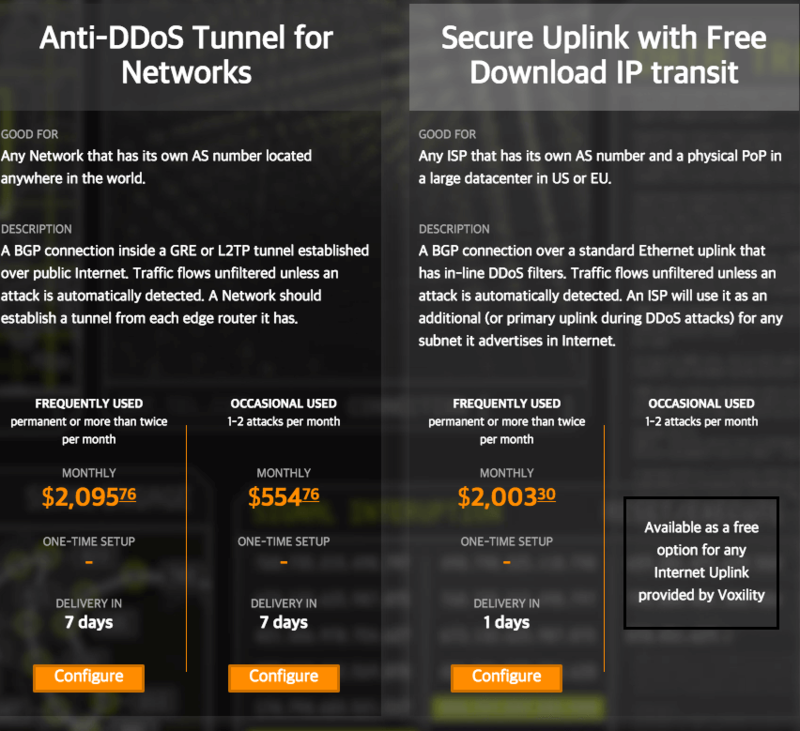 There are currently three DDoS Protection plans starting from $552.42/mo for occasional protection (1-2 attacks per months) and going up to $2086.92/mo for more frequent activity with DDoS attacks. Voxility’s Dedicated Servers instant activation pricing plans are varying for different locations, ranging from $115.00/mo to $1317.12/mo. To see in further detail, click here. Voxility’s Dedicated Servers custom based pricing plans are starting from just $50.89/mo. Internet Access available for both Dedicated Servers and colocation starting from $0.33/Mbps for restricted network options and starting from $0.7/Mbps for Direct Access to Premium Networks. Voxility’s Colocation offerings vary as per each datacenter location, starting from just $232.02/mo. 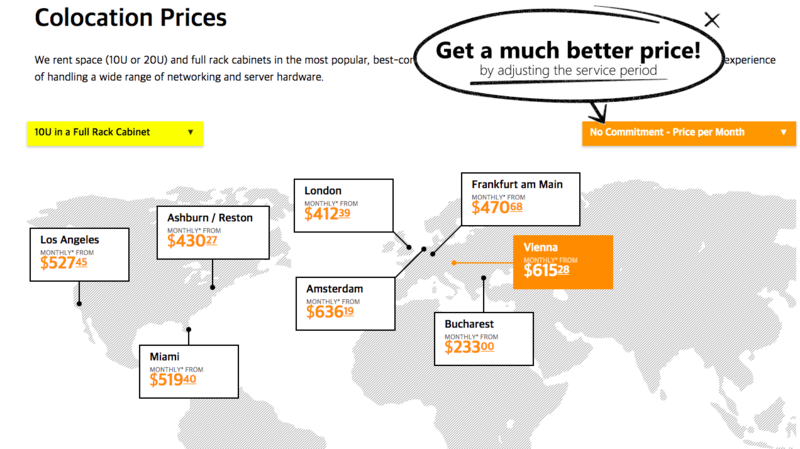 The price you receive is the same price the datacenter charges without any markup. If it looks expensive is because of premium the landlord asks as he offers so many interconnection options within his property. Starting from just $55.00/mo. If you are starting a personal site or a small business, Voxility is definitely not for you. It’s a solution for large-scale enterprises that are looking for unique internet tools and solutions for their business. Voxility’s services are over the top and indefinitely reliable. It is a company worth recommending and a deal worth making. Let me know what you think about Voxility.